Fig. 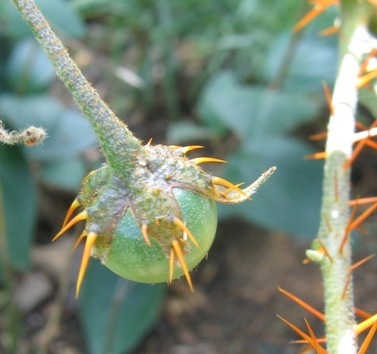 1 The bizarre porcupine tomato (Solanum pyracanthum). When all the basic plants are in place in the garden, an oddity here and there is in order. This week our local nursery is offering a plant that would fit the bill. The "Porcupine tomato" botanically known as Solanum pyracanthum (Fig. 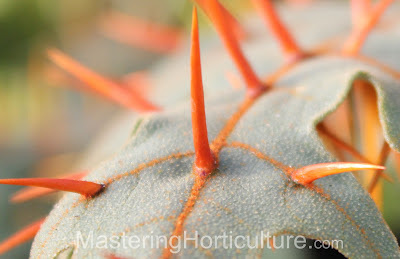 1) is a plant that is armored with spikes all over. 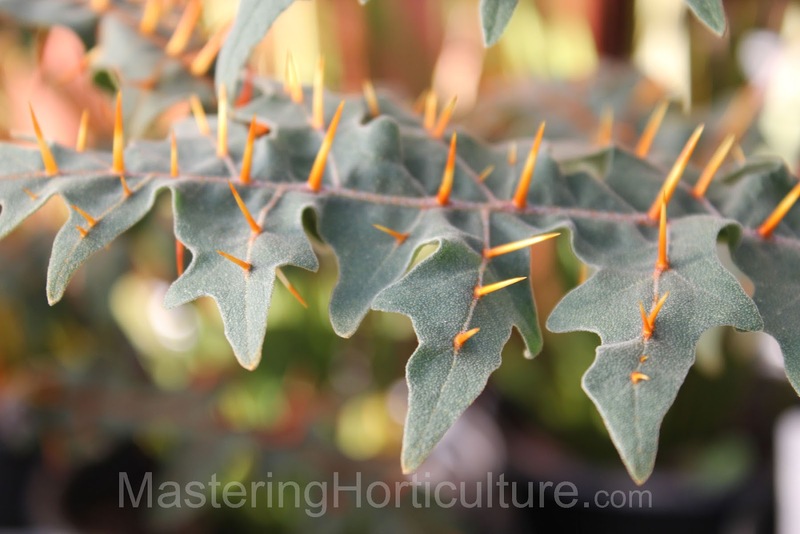 In spite of being prickly, some ornamental features can be attributed to this plant. The bright orange spikes provide a pleasing textural and color contrast against the bluish green velvety leaves (Fig. 2). The royal purple petals are complemented by protruding yellow stamens in the middle. Eventually, small cherry-tomato-like fruits will take the place of the colorful flowers. A plant with such attributes definitely makes a statement in any garden. This may be an ornamental shrub but the plant is definitely for your eyes only. The velvety green leaves may look soft and friendly but the dagger-like spikes (Fig. 2) that are spread all over the plant make the plant look utterly foreboding. I would not recommend this plant near playground areas. The quills would deter any one from touching the plant but the danger does not end there. The plant is known to contain various toxic substances on the leaves, stems and fruits - just like most solanaceous (night shade) plants. Because of this, it is not clear whether the spikes were meant to protect the plant from humans and animals or vice versa. Fig. 3 Solanum pyrachantum flower. 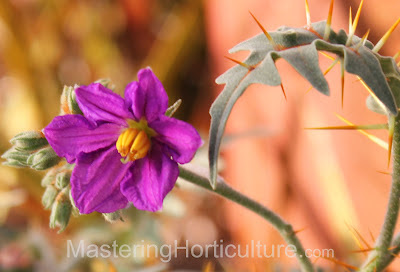 Solanum pyrachantum, although related to food crops like potato, tomato and eggplant, has been cultivated solely as ornamental plant. And we will keep it that way! 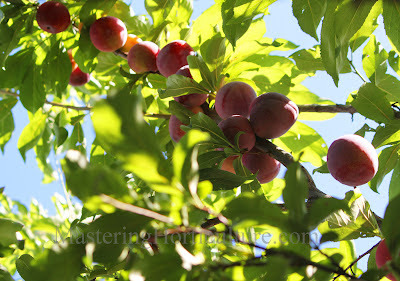 Santa Rosa plums (Prunus domestica 'Sana Rosa'). Baskets of dark ripe plums have always been one of the defining marks of summer in our home. 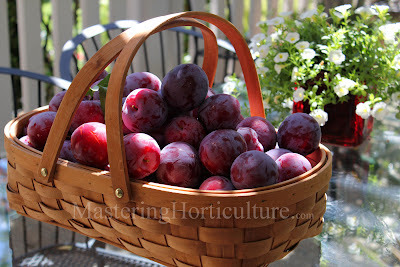 In some years we need smaller baskets than others, but there never was a year when we did not have plums ever since we planted the tree. Traditionally, I would preserve enough plum sauce for us and our extended family. This year, I did not get to do any canning (except for a couple jars of plum syrup) which I hurriedly make on the day we left for Taiwan. It was a good thing that our friends from church came to pick them while we were gone - at least the fruits were consumed and not wasted. Towards the southern side of the plum is a mulberry tree which is growing at a very fast rate. It will have to be trimmed if not pollarded so as not to jeopardize the productivity of the plum. 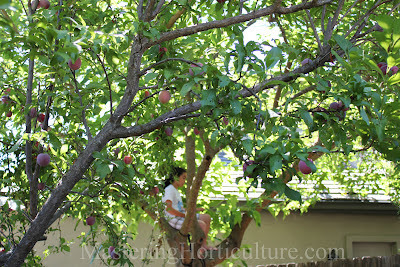 My daughter is perched on the mulberry tree. The garden presents a never-ending list of opportunities and challenges that varies from season to season. The gardener may never master the garden but with persistence, every experience is an added arrow into his quiver. This is a partial glimpse of my vegetable garden this year. Instead of showing the fruits, I chose to focus on the flowers. 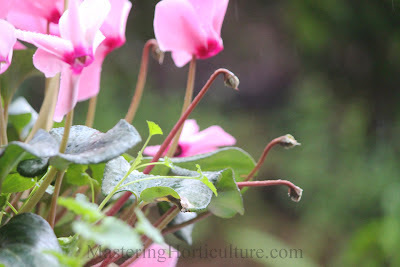 Flowers are generally the early indicators of a forth coming harvest for any food crop. For some plants such broccoli and cauliflower, the flower directly translates to the crop yield. Still for other annual plants where the leaves are the harvestable parts, flower initiation marks the cessation of productivity. Basil and cilantro (Fig. 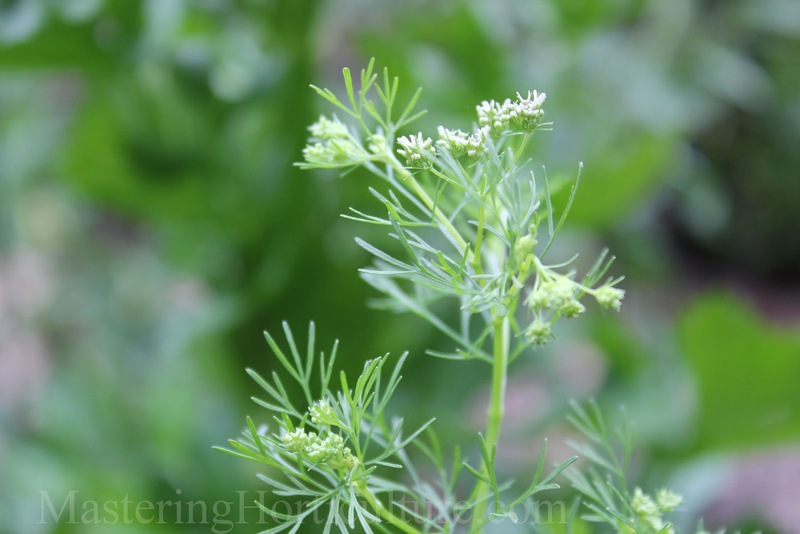 2) are among of my favorite herbs of all times. Basil is generally a summer crop and a long-day plant, which means that it flowers when the daylength (photoperiod) is longer than 12 hours per day. 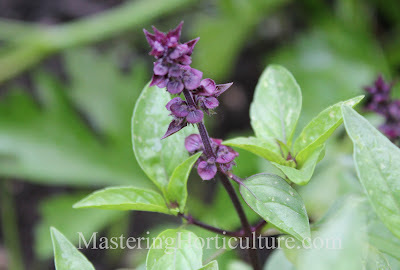 Thai basil (Fig. 2) is particularly sensitive to increasing photoperiod - the seedlings almost always have flowers when I buy them from the nursery. For a plant where the leaves are the harvestable/edible part, this poses a problem. However, that is when management comes into play. It is my practice to decapitate my basil plants at the slightest hint of flowering in order to induce branching and prolong vegetative growth. The 'Meyer' lemon seems to be enjoying its current location (Fig. 3). When my father-in-law and his wife could not get it to fruit in their shady front yard, they gave it to me - knowing that we have the sun here. So far it is looking good. 'Meyer' lemon, which is believed to have originated from China, is different from the true lemons such as 'Eureka', 'Lisbon', and 'Ponderosa' in that it is sweeter and less rindy (thinner rind). Such characteristics are attributed to a genetic relationship to the Mandarin orange. Last winter I planted a row of celery (Fig. 4). It was great to have something green in the garden during the dead months of winter. It was but we could not use it all up. I left the plants to flower to encourage the pollinators to linger around. 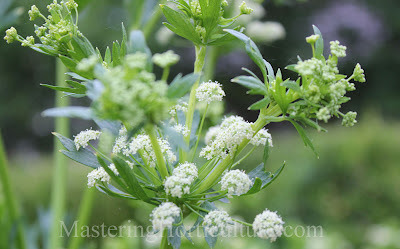 Every gardener in our area would be interested to know that celery is deer resistant. But then again - as I always say when people ask me whether a plant is deer resistant or not - it all depends on how hungry the deer are. Not all good things are meant to be for the gardener. I planted beans and watched them grow all the way to flowering (Fig. 6). One morning after I took the picture above, all those plants were defoliated. Everything above ground was gone except for the stems. To say that I almost cried is an understatement. The voles are here and they are destructive! Some say that voles come every three years; 2012 appears to be third year. Sadly, we'll have no beans this summer. 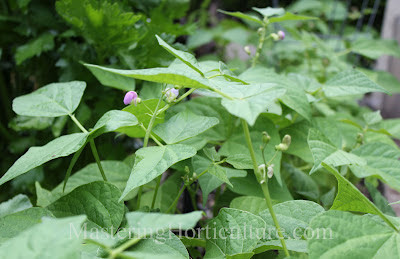 From last year's harvest, I saved the really small tubers and planted them in early spring. If it is still true that the condition of the foliage (Fig. 8) is an indication of what lies underground, then these spuds must be hiding some gold in the ground. Unless, of course, my enemies (voles) have dig a secret tunnel to get to the tubers. This is my first time growing tomatillo. So far the plant is doing what it is supposed to. Flowers hang from the branches but there has been no sign of fruit as of this time. I keep my fingers crossed on the possibility of homemade salsa verse. What's flowering in your edible garden today? Campanula punctata. Bell-shaped flowers that dangled from slender stalks periodically grabbed my attention as I roamed my mother (in-law)'s country garden in Fortuna, California. Campanula punctata (Fig. 1) has flowers (either white or pink) that are tinged with fine purplish dots which make them appear delicately translucent. (These dots are the distinguishing characteristic of the species punctata). The scalloped edges of the corolla are lined with delightful trichomes. 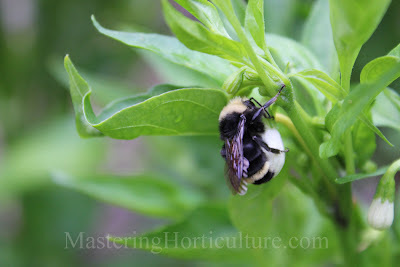 I suppose that they function, among others, to aid pollinators in reaching their desired destination. Fig. 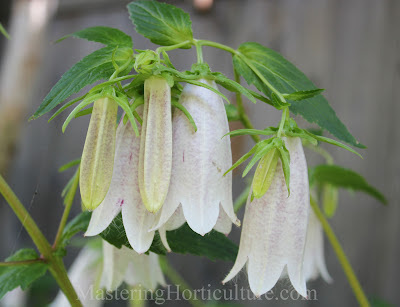 2 Campanula punctata grows in the shade. Sun Exposure. I observed that the plant was growing in both full sun and shady areas of the garden with no obvious growth difference. 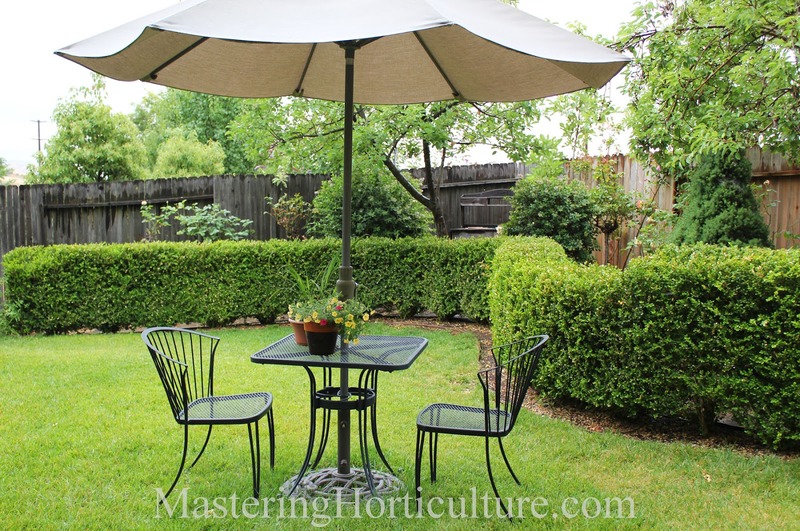 When it comes to determining whether a plant is good for the shade or full sun areas, the determining factor is usually their water requirement. When a gardener can assure that the plants get enough (not too much) water regardless of position in the garden, then the plants can perform well regardless of sun exposure. The plant has soft tissues hence drainage is important in order to avoid rotting of the stems. Growth Habit. This perennial plant is a moderate grower and a vigorous self-seeder. (I know this for sure because when I visited the garden a year ago, they were not there, but this time they were all over the place.) 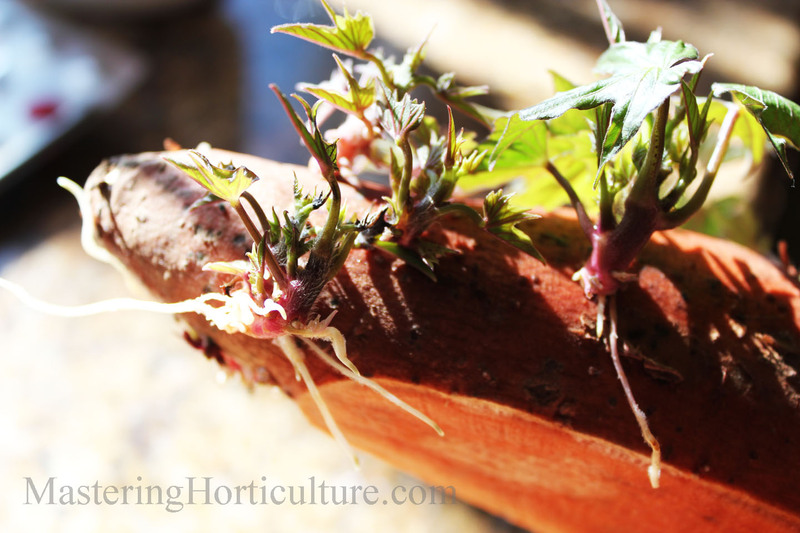 The plant multiplies itself in two ways - creeping rhizomes and traveling seeds. Regular division is necessary to promote good plant vigor. In as much as blooming occurs in spring to summer, it is best to divide the plants in the fall. I brought home some rhizomes of this plant for my garden. I imagined that they would look great in the shady "Down Under". Unfortunately, the voles got to them before they had a chance to get established. Sad. 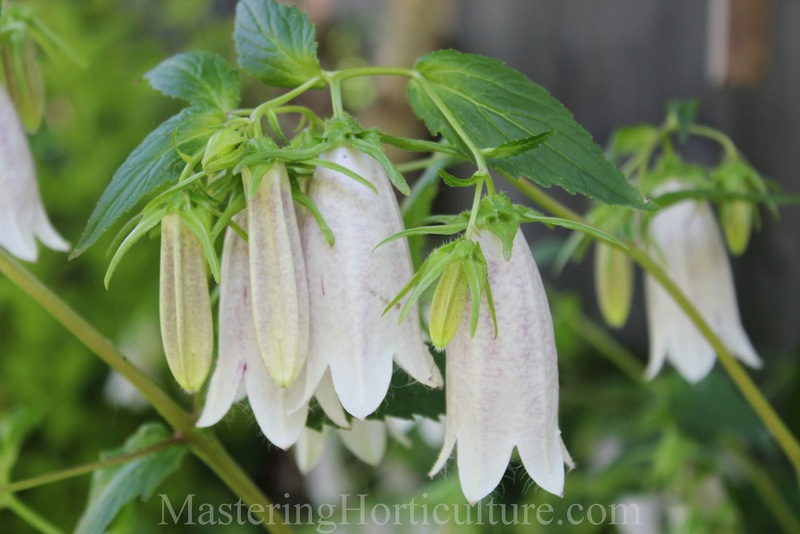 There are hundreds of species in the genus Campanula; which one have you tried in your garden? At last I made it to AVRDC - The World Vegetable Center! Coming to this place has been a long dream especially when I was working as a plant scientist in the Philippines. Hence, this is a dream come true! My family was given an exclusive seminar by Maureen Mecozzi, Head of the Communications and Information Department. Later on Willie gave us a tour of the research facility. It was indeed a great experience for all of us. Willie (L) gave us a tour of the research center. 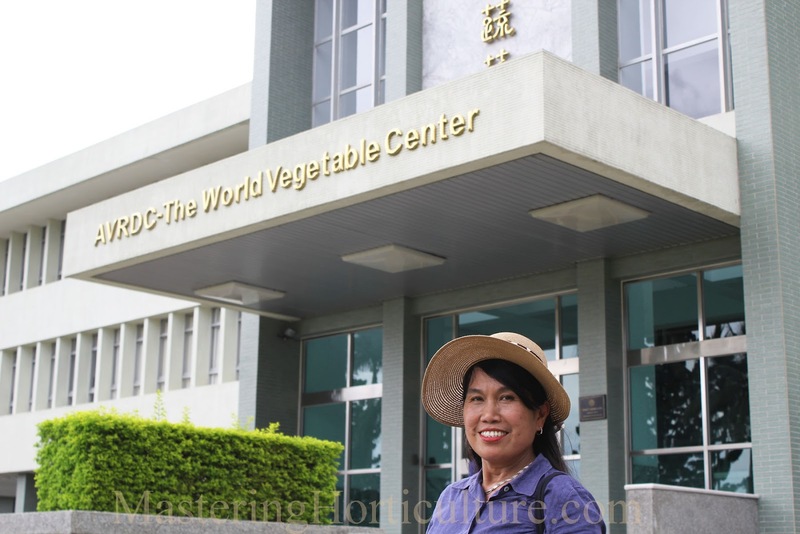 I'll write more about AVRDC - The World Vegetable Center later. Fig. 1 Calibrachoa enjoys the shade under an umbrella. It's that time of the year again when my family takes a summer trip. This time we are in Taipei, Taiwan (Fig. 4). As we tour this place and experience the conditions that prevail, I think of my garden back home. For my plants (Fig. 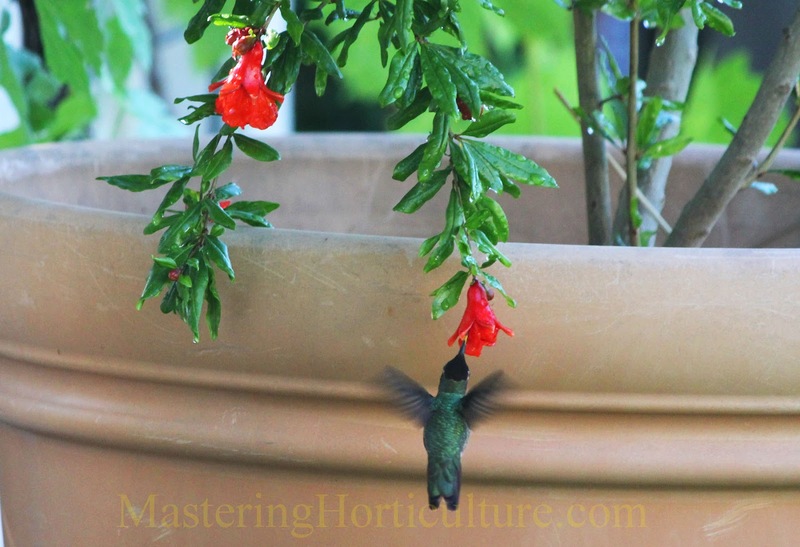 1) to grow they have to be consistently watered as the environment is dry. Their counterparts in Taiwan (as in any tropical area), however, can remain alive in almost dry soil much longer - as an effect of the high atmospheric humidity. Being a gardener in California, a semi-arid area, I envy the growing conditions of the tropics. Fig. 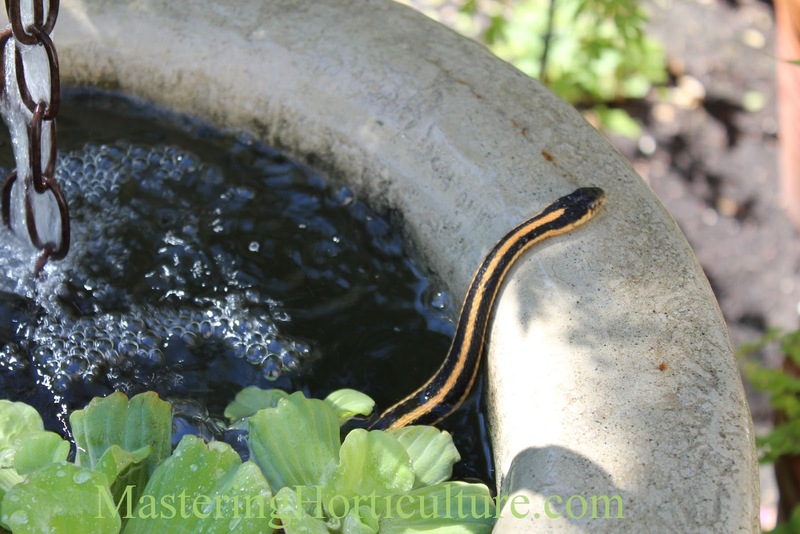 2 A garter snake takes a dip in the fountain to cool down. In the tropics, plants and animals maintain their lives throughout the year in a relatively consistent fashion. 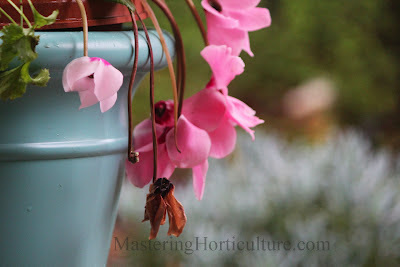 At home, my plants undergo a period of slow to no growth in the winter and a period of rapid and prolonged growth in the summer. Even some animals that hibernate during winters become incredibly active (Fig. 2) during the warmer periods of the year. Fig. 3 A place to sit in the cool of the day. 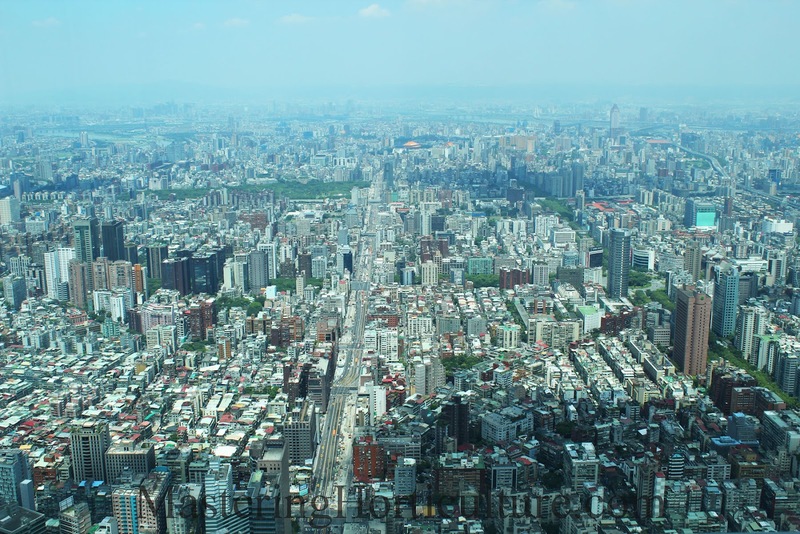 When I look at the city of Taipei (Fig. 4) there seem to be a very limited place for gardens. The place is covered with tall buildings. Private gardens, if they exist, are kept privately on rooftops or on balconies of apartments. For example - from my hotel room, I can see a beautiful but very small private garden with a pond that has large koi fishes. Vines climb all over the interior walls surrounding the garden while elephant ears grow from large clay pots. But if you are just walking on the streets, the gardens seem not to exist. Fig. 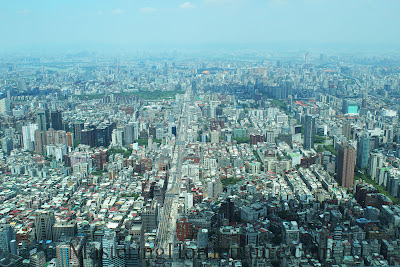 4 Taipei as seen from the Taipei 101 building. 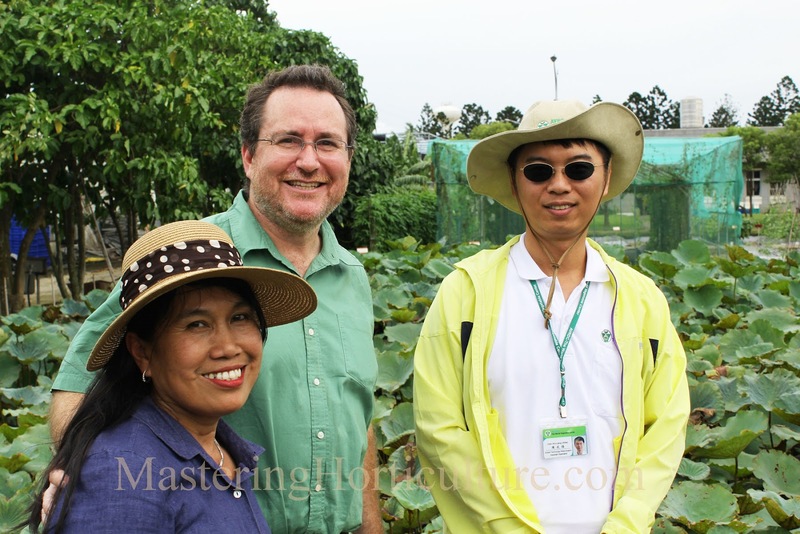 Tomorrow, we will travel outside of Taipei and visit the headquarters of the World Vegetable Center, formerly Asian Vegetable Research and Development Center (AVRDC) in Sanshua, Taiwan. There we will see more of the agricultural instead of the technological-center Taiwan. I'm looking forward to visiting AVRDC and hoping to bring back new ideas in vegetable gardening. 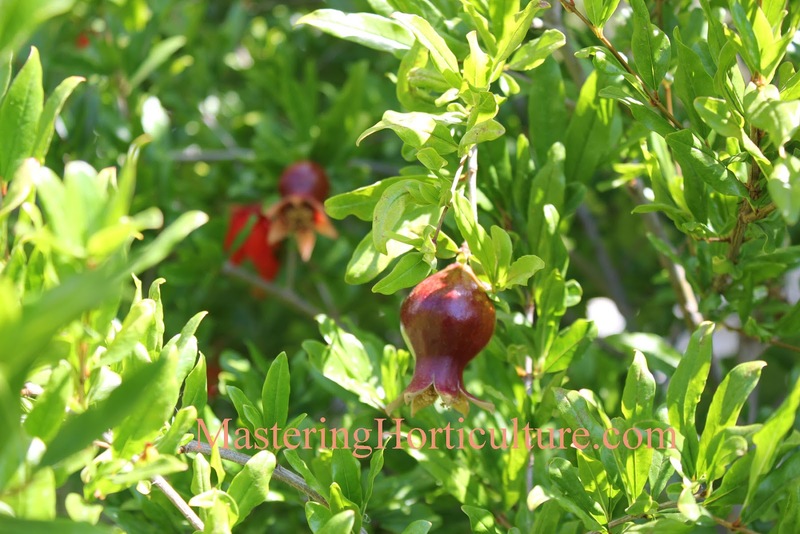 When I planted the pomegranate tree in my backyard there was only a thought of human food. Little did I know that the hummingbirds also had some interest in the tree. Now that the tree is in bloom, every morning, the birds dart like fighter jets around the tree, attacking each other in order to declare ownership of this luxurious resource. Then the successful one gets to enjoy the nectar from the bright red flowers. 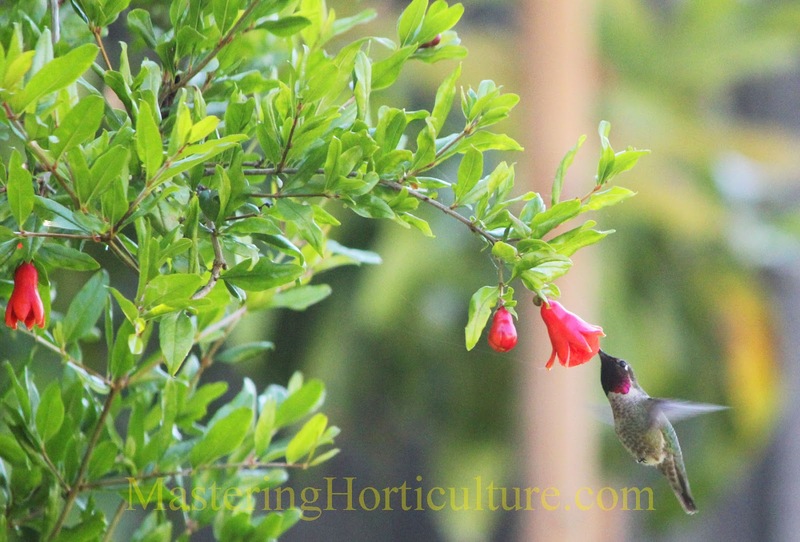 The fruit tree doubles as hummingbird attractant. This makes the pomegranate a multitasker plant..
Plants that can multitask are always desirable. Fig. 1 Cyclamen flowers: before and after pollination. The cyclamen flower continues to amaze me. 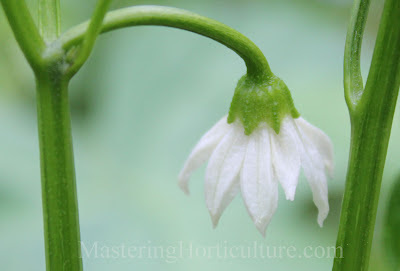 In some of my previous blog posts, I described my observations on the movement of the petals (corolla) prior to fertilization and the eventual behavior of the seed head. But the uniqueness of the plant has not ended there. This beautiful plant is more mysterious than I originally thought. Fig. 2 Unfertilized flowers fade away. Corolla of unfertilized flowers remains attached to the peduncle. It has been my recent observation that the corolla (petal) can fade away in two different manners depending on whether the flower is pollinated or not. Firstly, flowers that have not been pollinated tend to senesce naturally while they remain attached to the peduncle. The unpollinated flowers undergo a gradual decline of turgor resulting in wilting of the flowers (Fig.1). This is then followed by a gradual discoloration of the corolla. It is noteworthy that the corolla remains with the peduncle when pollination fails (Fig. 1). The flower failed. Fig. 3 After pollination flowers turn into seedheads. Secondly, flowers that have been pollinated shed off their corolla shortly after fertilization has taken place (Fig. 2). In other words pollination results in corolla abscission. 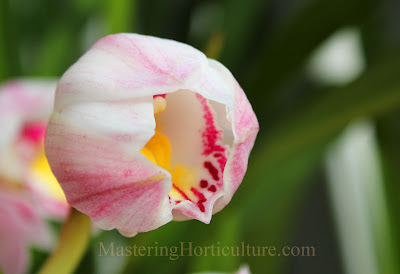 (Abscission is simply the natural separation of any plant part from the main plant system) It has been established through research that there is a significant increase in ethylene levels on pollinated flowers as compared to the unpollinated ones. Combine this thought with the common knowledge that ethylene causes abscission among others and we get an explanation for the abcission of the corolla in fertilized flowers. The flower whose goal was to attract pollinator now enters a new stage - to support the developing embryo. At this point, the corolla or petal has accomplished its purpose and is no longer necessary - it falls off the flower cleanly. When flowers begin to lose the flow of fluids and sugars from the main plant (Fig. 1) then how can one expect further production of plant hormones, such as ethylene, from these parts anymore? So the idea that ethylene is the cause of corolla abscission is kind of counter-intuitive. There are evidences that show the role of ethylene in the development of the embryo. The separation of the corolla could be an incidental occurence as the sepals begin to push downward to enclose the recently fertilized ovary (Fig. 4). In contrast, the unfertilized flower that has already lost its turgor (Fig. 2) no longer have the force to do anything - such as push the corolla off the flowers. Fig. 4 The sepal enclosing the fertilized ovary after pollination. Every plant has a set of unique behaviors which the gardener, given enough time, eventually comes to notice and appreciate. Echeveria hybrid 'Neon Breakers' has been added to my succulent collection this week. 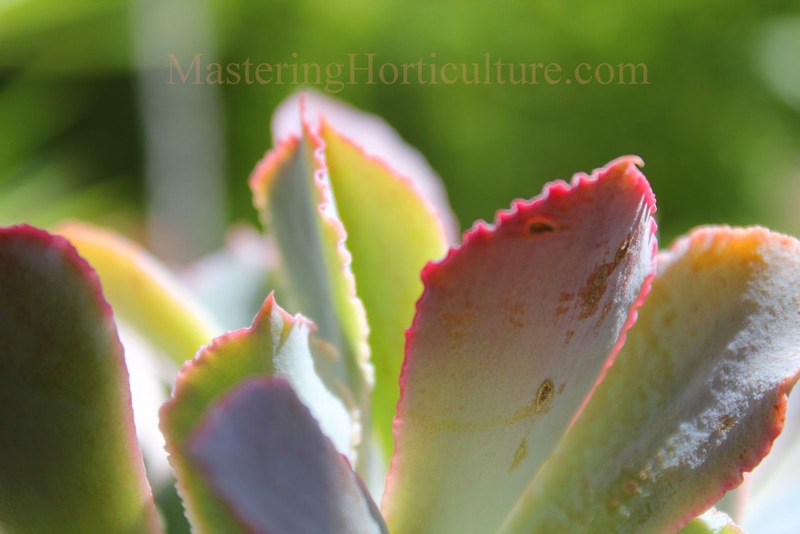 It is a relatively new patented plant which is similar to but more robust than the unpatented commercially grown Echeveria shaviana 'Pink Frills'. It is a beautiful plant with very marked red-colored ruffled leaf-margins. It will be interesting to see how it performs in my garden..
'Neon Breakers' resulted from the breeding work of Renee O"Connell in 2005. Fig. 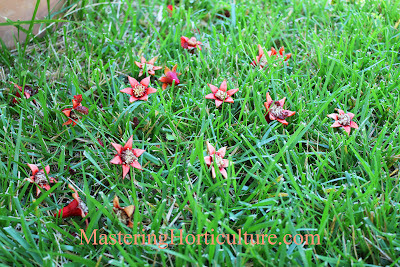 1 Pomegranate (Punica granatum L. 'Wonderful') flowers on the ground. A star is a promise of illumination - like a flower is an early promise of a fruit to come. 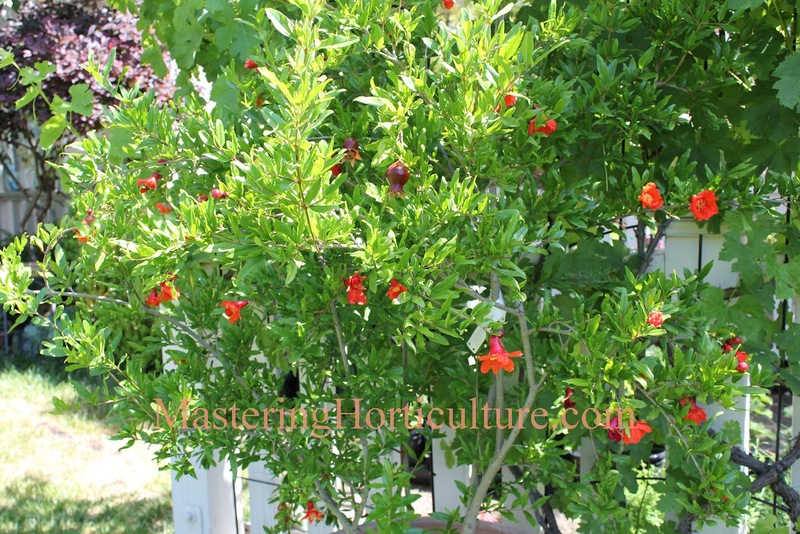 This season, my pomegranate tree (Punica granatum L. 'Wonderful') growing in a large pot is producing numerous bright colored flowers. However, this week the flowers are dropping like falling stars (Fig. 1) at a very high rate. The only factor that I can attribute this to is the sudden rise in temperature - from the 70s to high 90s (F). Fig. 2 Pomegranate at an early stage. Temperature and humidity both play an important role in fruitfulness of orchard trees. 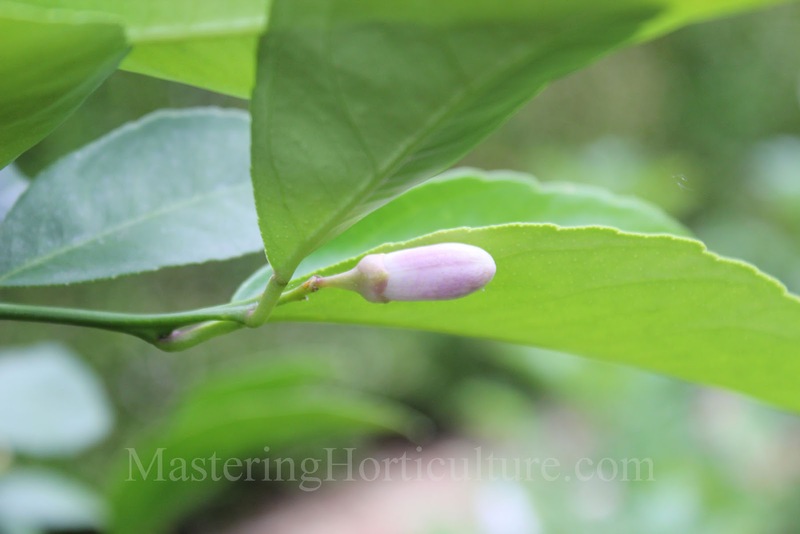 As a general rule, lower temperatures - without the frost - is most conducive to better flower initiation, successful pollination, and fruit set. On the other hand, high temperatures (90+ degrees F) and low humidity can result in the abscission of flower buds and fruitlets (Fig. 1) - leading to unfruitfulness. In our area, winter and early spring temperatures may be favorable but summer temperatures can be detrimental - hastening the deterioration of the embryo sac and the premature senescence of the ovules. 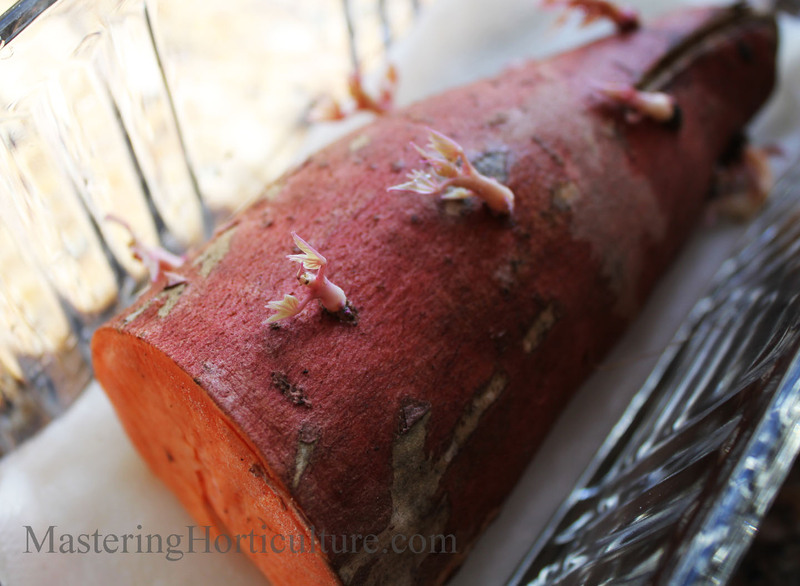 Based on last year's observations, Pomegranate 'Wonderful' blooms continuously from spring to fall (Fig.3). Some of the earlier flowers managed to set already (Fig. 2). I am assuming that there are more fruits yet to set when the temperatures relent once more. But we'll see...after all, this is only the second blooming year for this tree. Fig. 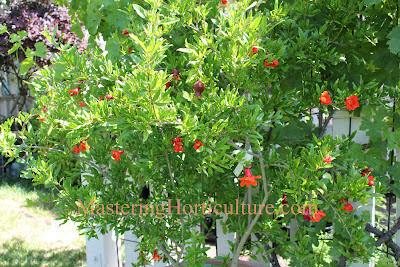 3 Pomegranate (Punica granatum 'Wonderful') in bloom. High temperatures inhibit fruit set in a number of plants. The reason for this was demonstrated in a study on flower development and fruit set in apricot (Prunus armeniaca). Results showed that warmer temperatures hastened that external development of flowers without significant advances in pistil development. For fertilization to take place, the pollen and the pistil need to be synchronized. Under warm temperatures the flower can unfurl its petals that attract pollinators but the ovules are immature. I hate to use this analogy but it is like a girl acting like a grown-up prior to puberty. 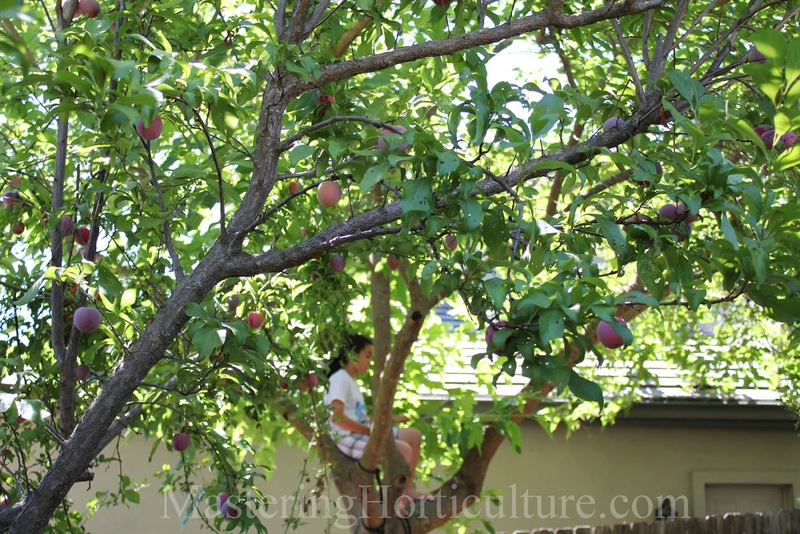 In fruit trees, this situation does not end up in a successful fruit set. Abscission of flowers and fruitlets is a natural mechanism for the plant to retain enough fruits that is equivalent to its capability to support under the existing environmental conditions. Last week my husband updated the fountain that runs the water in the old urn. The design is inspired by a Japanese-style rain chain. It is very simple and yet the sound and motion created by the water add so much to the calming effect of the garden especially on a hot summer day. 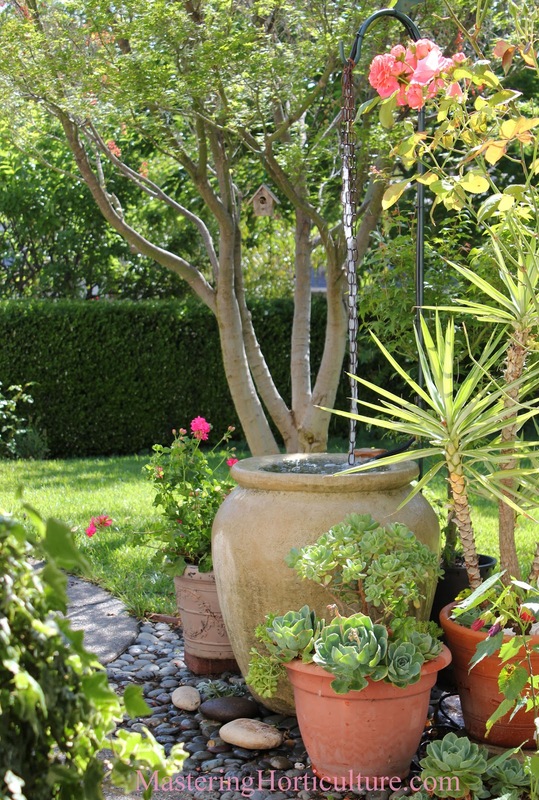 The sound of trickling water makes a garden seem peaceful and inviting. Two lemongrass (Cymbopogon citratus) seedlings found their way into my garden last week when I bought two plants from Green Acres. During the last two decades of living here in California, this is the first time I owned a live lemongrass! When I was growing up in the Philippines, my grandmother always had a huge specimen of this herb in our backyard. I can still remember how it grew so robustly in a seemingly shady space as it was situated between the banana plants and a dwarf jackfruit tree. Whenever my grandmother prepared fresh-water fish and shell fish, which were so common in our diet back then, I always expected she'd ask me to get some leaves of the 'baraniw' (the Ilocano term for the lemongrass) for her. From what I can recall, the plant prefers to grow in soil rich is organic matter. My grandmother did not have to water her plant since it rained almost nine months per year in her garden. In my case, however, I will have to compensate for the dry condition of the area through watering until the plants get established. During my growing up years, I never saw a lemongrass flower - which means that the only method of propagation for the plant I've seen so far is cloning. However, I am prepared to see the effect of the different photoperiod on this side of the globe on the flowering of lemongrass. It will be a good experience to grow this tropical plant in our Mediterranean climate. So far, the plants have been transferred into larger pots although I intend to plant one of them in the ground soon. 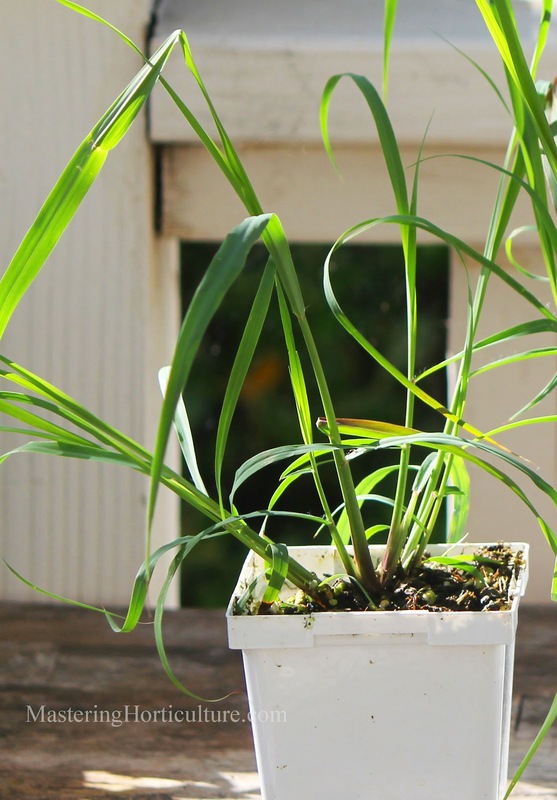 The lemongrass looks nondescript but the citrusy fragrance of the plant is not common at all. 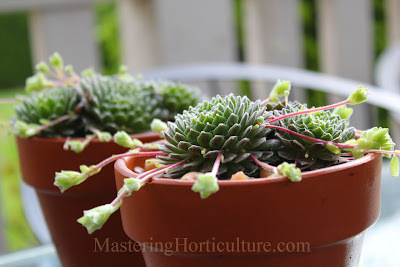 One of the many succulents that are proliferating in my backyard is the Sempervivum arachnoideum -commonly called "Hen and Chicks" or "Cobweb Houseleek". Every year when the temperatures start to warm up, they multiply by sending out runners that look like tentacles from within the overlapping layers of the older leaves. 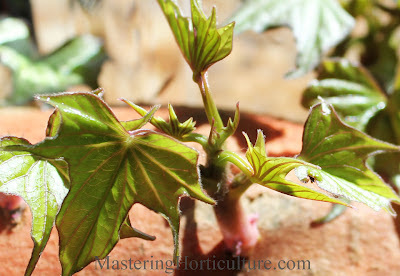 I noticed that the rosettes of leaves during the winter months (Fig. 1 and Fig. 2) do not show as much 'cobweb' and are not as tightly arranged as the Sempervivum arachnoideum in the hotter months. This could be an effect of lower light intensity and shorter photoperiod combined with sufficient soil moisture during the cooler months. The plant tries to expose as much of its leaf area in order to maximize exposure to sunlight. The lose rosettes therefore could be a symptom of stress from insufficient. On the contrary, under adversely hot conditions, the plant's natural reaction is to prevent moisture loss - and thus closing as much exit points of moisture as possible. Fig. 2 Sempervivum arachnoideum: loosely-arranged rosettes and insignificant 'cobweb'. 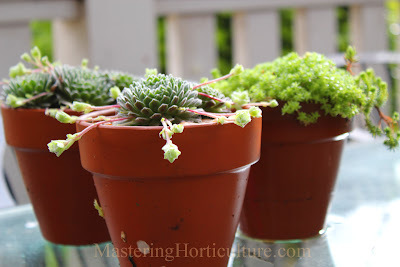 Regardless of their seasonal behavior, Sempervivum arachnoideum in small containers look great. I intend to grow more of them this way and give as presents to house guests. Yes, Mastering Horticulture now has a dot-com address. Basically, the old one remains but this easier-to-remember address points to the same website. 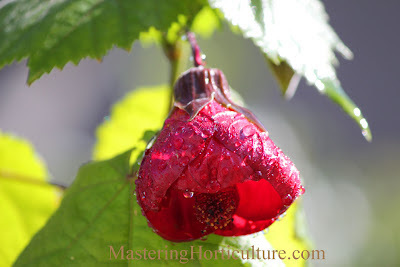 Last fall, I bought a foot-tall blooming Abutilon plant from the Farmer's Market in Placerville. Winter is almost over and the same plant remains blooming and seemingly unrelenting (Fig.1). The plant has flower buds that come out wrapped in a blackish red calyx (Fig. 2) which eventually opens into a bell-shaped pendent flower with overlapping dark scarlet petals and even a red peduncle (Fig. 1). Twelve years ago when there were no tall trees in my backyard, I planted my first Abutilon and I was very pleased with its vigor. Sadly, on its third year, it began to shade some important plants round it. It had to go in favor of the other ones. But because of its desirable characteristics as a plant, I bought this new plant (Fig.1) as a replacement for the old one. Common names include: Flowering maple; Parlor maple; Indian mallow; Chinese lantern, etc. They are closely related to Hibiscus (Malvaceae family). They are occasionally referred to as "maple" because of the resemblance to the actual maple trees in the shape of the leaves being palmate. 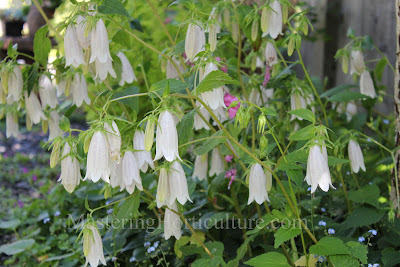 Abutilons are evergreen small trees that can grow up to about eight feet tall. They are fast growing plants. Given the right conditions they can reach their potential height on the second year. They bloom almost year round in our area. Of the numerous varieties, the most popular ones bear solitary and pendent flowers like the one I have now (Fig. 1 and Fig.2). There are some that bear flowers in panicles - dangling like their solitary counterparts. Green Acres, the mega nursery in the area, currently offers a wide selection of Abutilon. 1. Microclimate. Abutilons like places with a lot of light up a point when temperature interferes with its growth. In hot and dry areas like here near the Sacramento area, the plant prefers to grow in a sheltered south-facing location. Afternoon shade helps reduce excessive transpiration and scorching of the flowers. On the other hand, in places with cooler temperatures and more rains, full sun would work well. Always remember to garden with microclimate instead of the generic recommendations for your plants. 2. Fertilization. Being fast-growing and ever-blooming, the plant benefits from adequate fertilization. Phosphorous fertilization during the first and second year of growth ensures a strong root system. 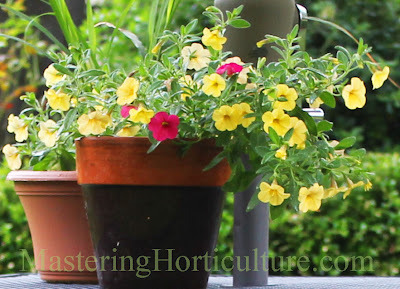 If it is grown in a container then regular application of a slow release balanced fertilizer is more important than those planted in the ground. The plant is responsive to fetilization as much as it is expressive of nutritional deficiency. Chlorosis is the first sign of nitrogen deficiency but make sure that it is not caused by insufficient or excessive watering. 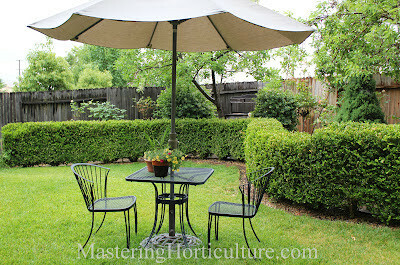 In general, I withhold fertilization starting in late fall to allow my evergreen plants to rest a little. 3. Pruning. The plant may be pruned to regulate its shape and size. In the spring it is best to prune the tree, removing all branches that have died during the previous season, before the temperatures warm up. Pruning may be done anytime to remove branches that stick out of place and also to encourage branching for a fuller shrub. 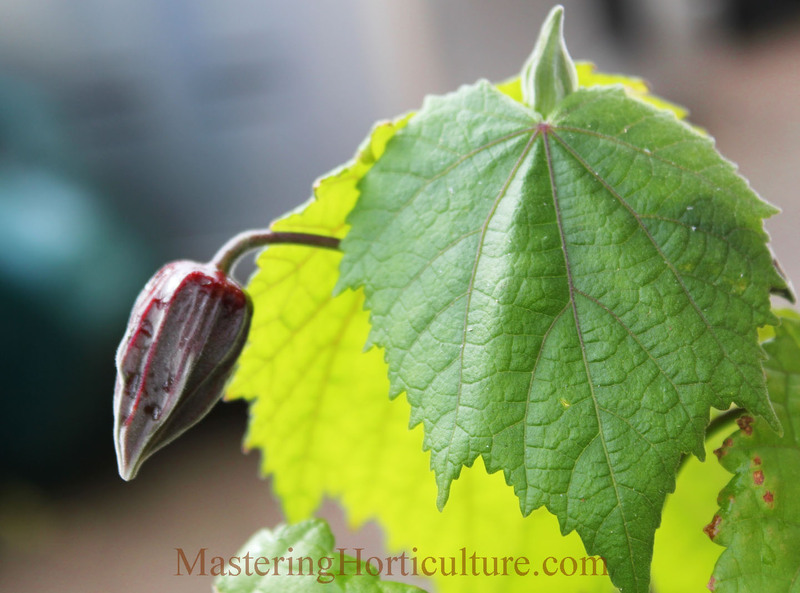 Abutilon: evergreen and ever-blooming perennial for the protected sunny location in the garden. 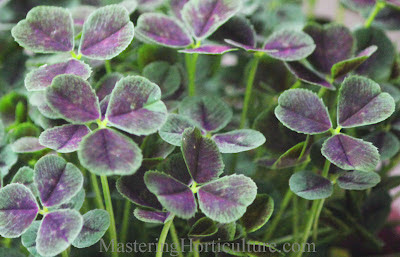 Trifolium repens L. 'Atropurpureum' (Fig.1) is one of many varieties of the plant that is commonly known as clover. 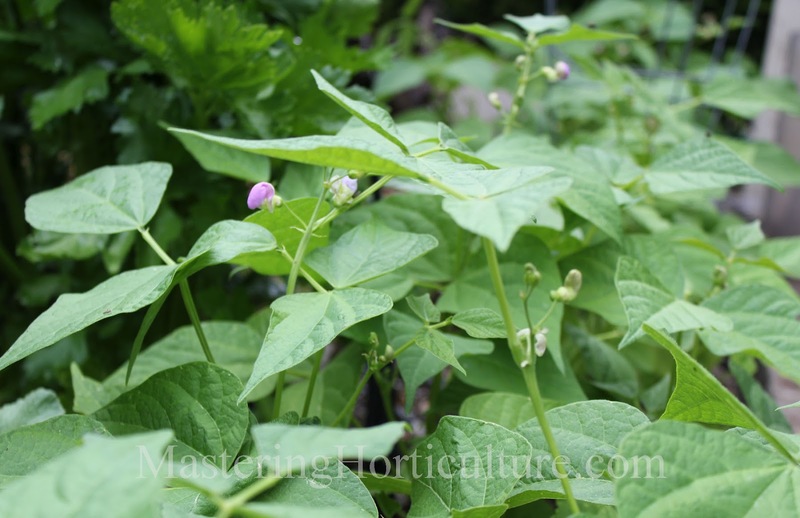 It is a spreading perennial plant primarily grown for its purple foliage that floats above the long spindly petioles. This plant is supposedly valuable as a ground cover for hot and dry areas making it a good choice for erosion control. This plant (Fig. 1) was available at our local nursery last week and I decided to try it in my garden. Initially, it will be planted in a container for observation to determine its growth vigor before releasing it to the ground. One can never be too cautious about plant families that have a reputation of being weeds. The dark purple leaves (Fig. 2) provided the reason for this variety to be called Atropurpureum. I am curious to see whether the color will change under higher light intensity in the summer. Fig.1 New sweet potato (Ipomea batatas) plant. If anyone would make a movie about my childhood days in the Philippines, sweet potato (Ipomea batatas) would show up over and over again in the background. Sweet potato is a must-have crop. The roots are eaten as source of carbohydrates prepared as dessert or snack food. Although it is nutritious and readily available, it does not have the reputation as a staple food unlike rice (Oryza sativa), corn (Zea mays) and cassava (Manihot esculenta). As a root crop it has a low acceptance possibly due to its flatulent characteristic. The young leaves, however, have a better reputation as green vegetable. They are cooked in stews or prepared as wilted salad. When wilted (not over-cooked) they taste like spinach. Believe it or not, some varieties taste better than others. The vines and the older leaves are used as feeds. 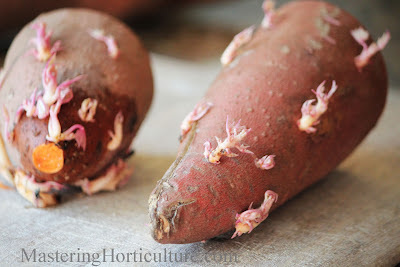 Growing sweet potato is very easy. In fact the American expression "Piece of cake", can be translated in Ilocano (my native dialect) as "Kasla agmula ti kamote" meaning "It's like planting sweet potato". There was a time when the roadsides in my barrio (village) were all planted with sweet potatoes. They were beautiful. 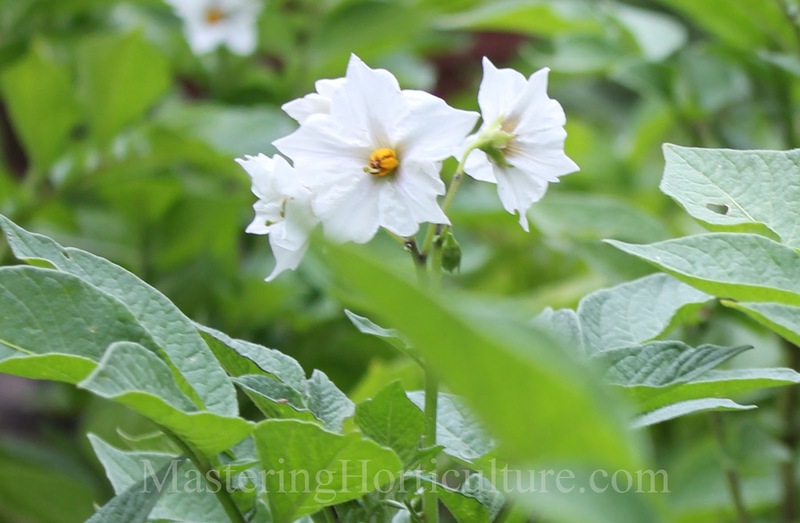 Here on the temperate side of the globe, there is also an increasing popularity of the Ipomea (sweet potato) as an ornamental plant mainly for its foliage. Fig. 3 A clean cut on one side of sweet potato. Now in my house, away from the barrio where I grew up, sweet potato only shows up on Thanksgiving and Christmas. A month ago while cleaning my pantry, I was in luck! I found two large sweet potatoes that were sprouting. The immediate thought that came to mind was planting material. They have been sitting there for at least two months. Sweet potatoes, commonly known in the US as yams, are storage organs where food and moisture abound. Because of that, the cells within the root are kept alive and capable of regeneration - starting a new plant. This is true for most of the food we eat that come in various forms of storage organs such as bulbs (onions - Allium cepa and garlic - Allium sativum); rhizome (ginger- Zingiber officinale); tubers (potatoes - Solanum tuberosum); and corm (taro - Colocasia esculenta). All of these examples will regenerate when the right conditions are met. In the home, the pantry seems favorable enough to initiate new growths on such vegetables. Fig. 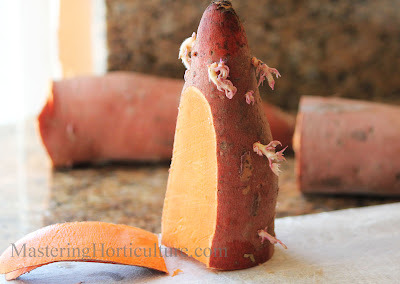 4 Wet paper towel encourages root growth on a sprouting sweet potato. Plants grown in the dark, such as those shown on Fig. 2 are etiolated and lanky. This, however, can be improved by exposing them to diffused light. What I did was cut one side of the root (Fig. 3) to provide a flat surface that would rest on the wet paper towel on a dish (Fig. 4). It has been my experience that growth of adventitious roots is enhanced by moisture - so the paper towel was kept wet at all times. Fig. 5 One week of exposure to light resulted in healthy-looking sprouts. After eight days of exposure to light, the sprouts showed a significant change in coloration (Fig. 5 and Fig. 2). The young sprouts begin to produce chlorophyll giving the leaves a green color. They have grown to be more stocky and strong. 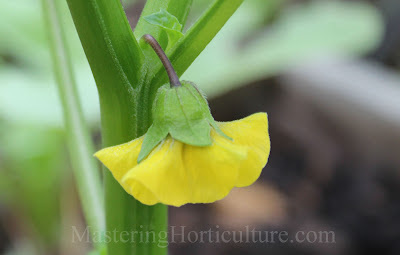 The same principle applies to potato (Solanum tuberosum) seed tubers. 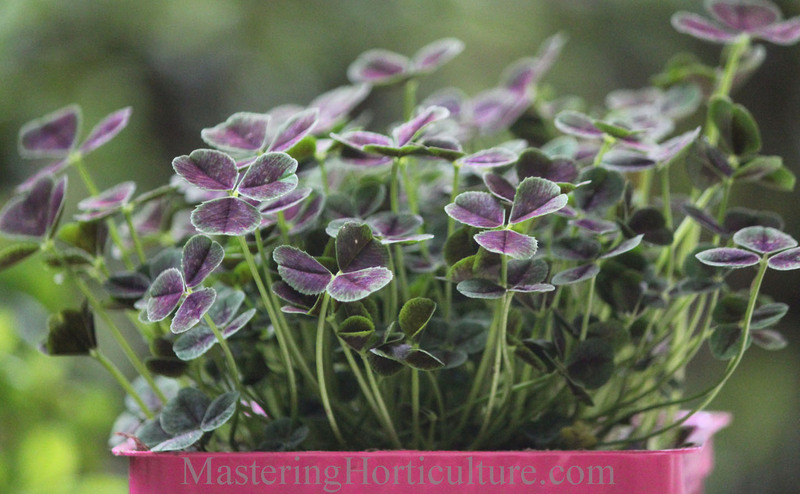 When their sprouts are pale, give them some time to get exposed to diffused light before planting them. The roots (Fig.5) look like they are ready to meet the soil but I will have to keep them inside for a little bit longer until the temperatures get warm. I invite you to watch this video to see how sweet potato is being used to end hunger in Mozambique. A. arborescens, also known as A. perfoliata var. 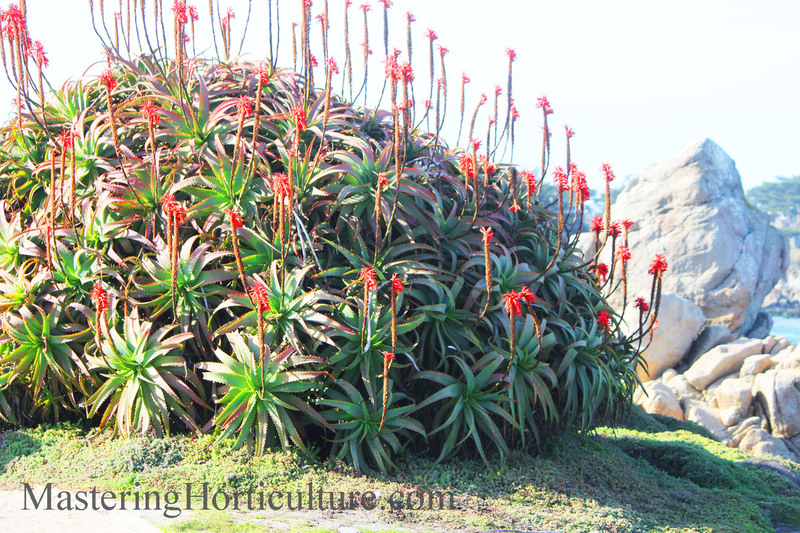 arborescens is commonly named as Octopus plant, Candelabra aloe, or Torch plant. The plant is multi-branched with rosettes of tentacle-like, partly concave leaves, thus the name octopus. Like most succulents, A. arborescens blooms once a year (spring to summer). Each rosette then sends out a terminal upright raceme that is covered with red flowers - transforming the plant to resemble the appearance of a chandelier (Fig. 1). According to the AHS, this plant is a native of Malawi, Mozambique, Zimbabwe, and South Africa. Based on the size of this plant (Fig. 1), however, the California coast seems to provide favorable conditions for its growth. This enormous Aloe arborescens is stunning but I will not have it in my yard because its leaves are sharply-serrated.